Teeth can become sensitive to hot and cold if the inner dentin becomes exposed. The dentin is underneath the enamel of the teeth and contains small tubes that lead to the sensitive roots of the teeth. The roots contain the nerves that elicit a painful response to certain triggers, such as hot and cold. Teeth may be sensitive due to a receding gum line. There is no protective enamel covering the teeth below the gum line. Excess plaque and tartar can cause inflammation of the gums that can cause part of the roots of the teeth to be exposed, resulting in sensitivity of the affected teeth. The wearing away of tooth enamel can also result in sensitivity. Highly acidic foods can erode enamel over time. After consuming acidic foods or beverages, you should first rinse your mouth with water and wait a half hour before brushing to avoid brushing away weakened enamel. Brushing too hard or using a hard-bristled toothbrush can also wear away enamel. Brush teeth daily with a soft-bristled toothbrush and toothpaste recommended for sensitive teeth. Use care along the gum line. Floss between the teeth and at the gum line every day to remove more plaque. 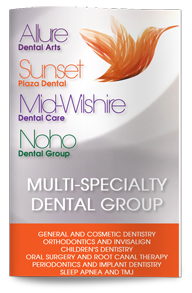 Be sure to make an appointment with our dentist in West Hollywood for regular exams to prevent an increase in sensitivity. The dentist may recommend a special toothpaste or may be able to use treatments such as fluoride, sealants, or bonding to protect sensitive teeth.